We were delighted this morning to receive some beautiful photos from Sebastian Heldt, a guest from Germany who stayed with us last year. I will add some of them to our website (www.daintreevalleyhaven.com.au) soon, when I do our next update. 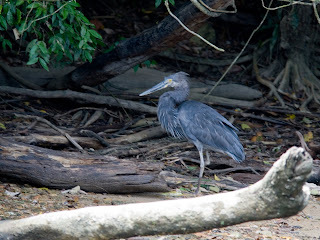 Meantime I'm adding his Great-billed Heron to the blog, with Sebastian's description below. The photo was taken while he was on a wildlife-watching cruise on the nearby Daintree River. The bird is indeed quite rare but is spotted fairly frequently here - and is one of the"'must-see's" for visiting birders. One guest on the boat spotted this Great-billed Heron (Ardea sumatrana) walking slowly out of cover on the sandbank for a few moments before returning behind dense vegetation. Our guide told us that this was a rare scene and we could be happy to have seen this elusive bird. At the first I didn´t pay much attention to this picture because it is a little blurred. But after researching a little about this species I see it with other eyes because it shows the birds environment and its elusive way of life. According to the "Handbook of the birds of the world" this bird is widespread but nowhere common and is classified as "near threatened" and poorly known.